It is only right to start this post by thanking everyone for all their kind words and support about my little kitty, who died yesterday. It has been quite an emotional few days for me and for the children. 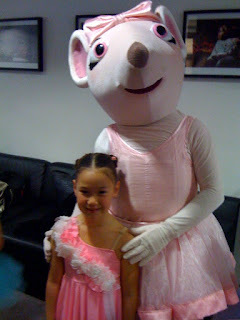 I blogged last week about FunnyGirl making it to the final round of judging in the Angelina Ballerina Children’s Award and today was her big day. We set off for London bright and early and arrived right on time at 10am. All of the other girls were there when we arrived and I don’t know about FunnyGirl but I was terrified. They were all visibly older and preened within an inch of their lives in huge tutu’s that wouldn’t have looked out of place on girls twice their size. Being the youngest FunnyGirl was up first. Her dance is not classical ballet like all of the other girls and I was so happy that her inner self is not wobbled in the slightest by her being the odd one out. She did look nervous before she went in but when she came back out having danced she was beaming from ear to ear. All of the other parents seemed to know each other and I felt as if I had stepped into some weird competitive playground game – it wasn’t nice. Now I was a dancer myself. When I left school I went on to further full time training. I was selected for the National Youth Dance Company with was a real achievement but I don’t have FunnyGirl’s natural gift. I had to work hard at what comes naturally to her. I dug deep for courage and asked how the parents all knew each other and was really shocked by the reply. All of their children were ‘JA’s’ they proudly told me. Now I know what a ‘JA’ is – but only because I was one myself. A ‘JA’ is a Junior Associate member of the Royal Ballet. They go to classes run by the Royal Ballet School at satellite centres across the UK. So not only was FunnyGirl the youngest – but she was the only child who was not part of the ‘JA’ program. She did her best – and that is all I wanted. We came a way with a fab goodie bag and now have to wait until mid December to find out who is the winner. From Angelina we moved on to the NEXT Spring 2010 press launch. They are pretty hot on the social media front. They have a huge Facebook group and a Twitter group that is growing day by day. 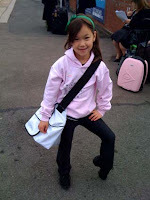 We were asked along as they are launching a children’s modelling competition in a couple of weeks – but we also got a sneak preview of the SS 2010 collection. In all honesty I haven’t been a huge fan of NEXT since the little ones came along. When I had No1 son 18 years ago – I bought all of his clothes from there and he did a few modelling jobs for them too. I personally have never bought a single item of womenswear from there EVER but in the last year I have bought a few bits for the girls. The beautiful red checked dresses that they are wearing in the Valentines Party shoot in Annabel Karmel’s new Princess Cookbook are from NEXT and were so popular with everyone that saw them. And on seeing this new collection I feel that I may be a convert. There are obvious influences from Balmain (yes my original v expensive jeans are replicated here for mums and daughters alike), Comme de Garcon, YSL, Burberry Prorsum and Sonia Rykiel. But you know what – it doesn’t really matter. NEXT’s quality is way above that of its high street contemporaries Zara, Oasis, Warehouse and H&M. This new collection has a real feel of fashion and modernity about it and I will definitely be getting a few bits for the girls and Sonny. They are launching a children’s modelling competition next week through their facebook group but I will do a dedicated post about that next week. A big thank you to Hit Entertainment and Next for the hospitality – and to the fab magician! It is totally odd in my mind that she made it to the finals. I know that you should have more faith in your own children and I am on the whole the proudest mum in the whole wide world but when it comes to creative talents I know that your ability is only a small marker in the final outcome. FunnyGirl does seem to have that extra special thing - whatever it is. I wish that ModelGirl had it, but she is simply a grafter. I wish I had it, but I was a grafter too, TotallySonny, well he lives in Sunny Son Land and everything is rosy there! see you ladies real soon. Not quite all the other kids were JA's. My daughter was last to dance and she just goes to the local ballet school, so the JA's must've been squeezed imbetween. My wife agreed with what you said though that the atmosphere was pretty intimidating. Anyway I hope if my little girl doesn't win it then your does.